This article explains the phenomena of lake turnover and stratification that typical fresh water lakes exhibit. The density of water is greatest at 39oF. Water cooled below 39oF becomes less dense and remains at the surface. At 32oF, ice begins to form. Warm spring air melts the ice and warms the less dense cold water. As surface water approaches 39oF, the differences in density are reduced, thus allowing lake mixing or turnover, which happens relatively quickly, usually in a matter of days. 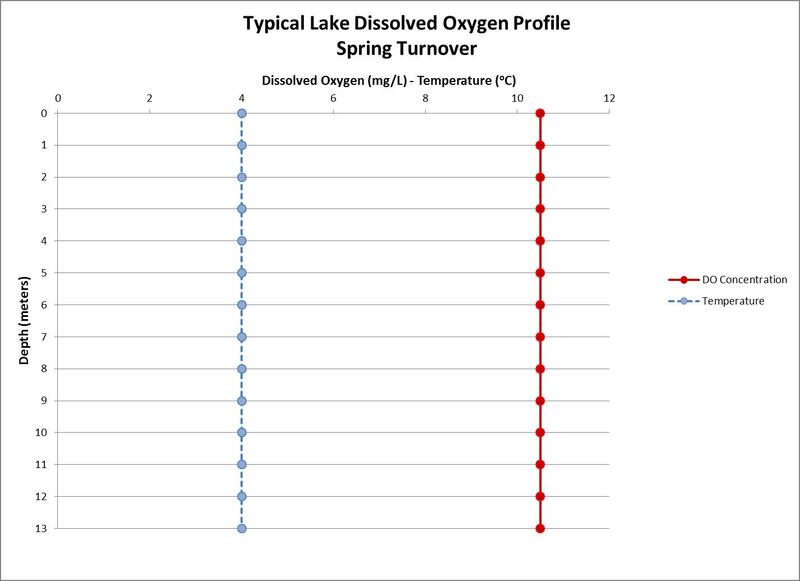 In an idealized lake, the oxygen concentration at spring turnover is at or near 100% saturation throughout the lake strata. As the temperature warms during the summer months, the top layer of the lake (epilimnion) gets warmer, while the bottom layer of the lake (hypolimnion) stays very cold. At the interface between these layers (metalimnion), a thermocline develops with the temperature changing very rapidly over a very short vertical distance. This thermocline creates a thermal barrier to the mixing of surface and bottom waters because of the different densities. The oxygen content of the hypolimnion (below the thermocline) is depleted rapidly (after only a few weeks of summer stratification) by oxidative processes (primarily biological decomposition of organic matter) and remains anaerobic throughout the stratification period. As the seasons progress and the temperatures drop, the epilimnion progressively deepens and circulation of oxygen-rich water extends deeper into the hypolimnion. Water temperature and thus, density, begins to approach equilibrium throughout the strata. Facilitated by this equilibrium, lake activity and/or atmospheric conditions (e.g., high winds) will cause the waters of the epilimnion and hypolimnion to mix, creating a fall turnover and a near uniform distribution of dissolved oxygen throughout the strata. With the advent of ice formation, the exchange of oxygen with the atmosphere ceases, although photosynthetic production of organic material in the upper layer continues throughout the winter. 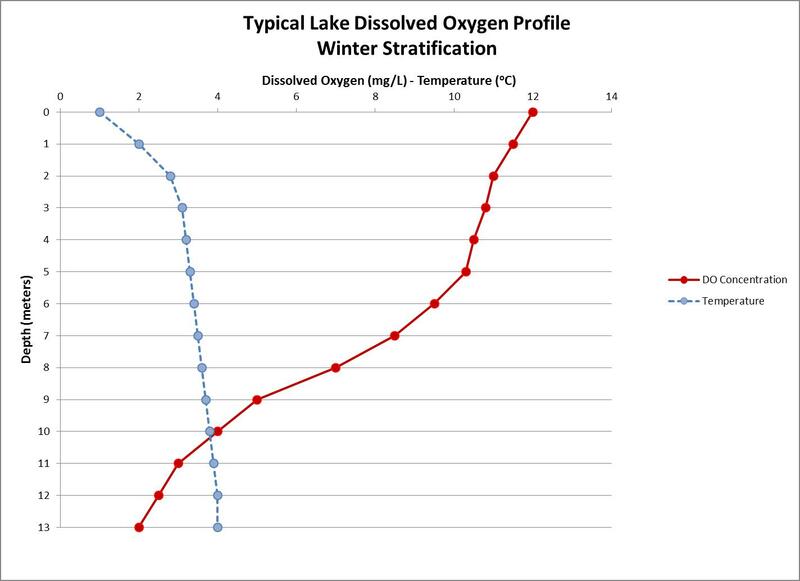 Dissolved oxygen concentration profiles would remain essentially at saturation at any given depth. 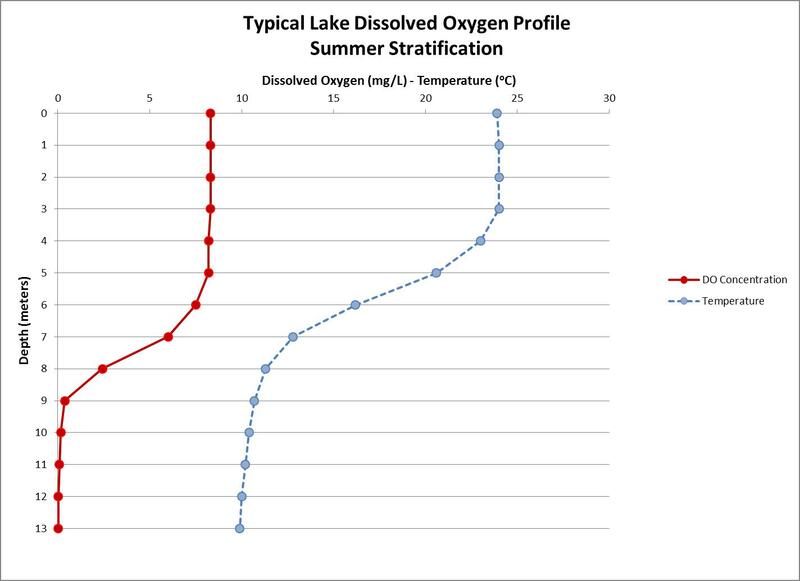 However, in highly productive lakes such as ours, more frequently observed is a reduction of dissolved oxygen concentrations with depth as oxidative processes continue (although at a reduced rate) and become acute at the sediment-water interface.